You DO NOT need a burn permit for a campfire in a fire ring. You DO NOT need a burn permit for burning barrels with screen covers that are located on a non-combustible surface. A FIREWORKS permit is not part of this online application process and must be obtained directly through the Vulcan County Fire Chief/Deputy Fire Chief. Before Applying Check For Fire Bans. Visit the Provincial Fire Bans website to check if any fire bans are currently active in your area. Burning Permits are for clean/dry wood ONLY! Prohibited debris includes, but is not limited to the above items. Fire permits are required year round. The fire must be set at the time and place indicated on the permit. The number of fires set at one time and minimum equipment needed may be specified if a class 2 permit is issued. A fire permit is a legal document which conditionally authorized a person to burn Class A materials (wood/paper) at a time specified on the permit. By obtaining a fire permit you have simply indicated you wish to burn. The responsibility for conducting a safe burn is yours. Anyone who sets a fire under the authority of a permit must comply with the following requirements and conditions. The fire must be supervised at all times by a responsible adult. No burning is permitted when winds exceed 15 km/hr or are gusting. Suitable fire extinguishing equipment to be located at the site. The 911 Dispatch Centre must be notified approximately one (1) hour prior to the burn taking place. No burning is permitted between the night hours of 10:00 pm and 7:00 am unless a special permit has been issued by the Vulcan County Fire Chief/Deputy Fire Chief. Only Class A combustibles are to be burned (clean wood/paper products). An accurate description of the size and the type of combustibles must be listed on the permit. Any breach of the above conditions renders the permit null and void and you may be held accountable. Other than campfires and Municipally approved incinerators, any person lighting a fire for any purpose must have a valid fire permit. Burning permits are valid for a maximum of 3 days from the date of issue. If conditions warrant, permits may be canceled at any time. Extensions may be granted under a new permit number, provided the required conditions are met. When disposing of a building or structure by burning, the building or structure must first be demolished. The burning of tires, plastic wastes or other toxic noxious materials or substances is not permitted. The Fire Chief, may suspend or cancel all permits or prohibit the lighting of fires with a Fire Ban. The general public is typically notified of Fire Bans via email, text SMS message, local news media, municipal website, Facebook and/or Twitter. When permits are suspended or canceled and fires are prohibited, all fires ignited under the authority of a burning permit must be extinguished immediately. Incinerator to be installed on a non-combustible base, positioned so as not to endanger other combustible materials or structures. Incinerator to be fitted with a tight meshed spark arrester screen (7 mm mesh)(1/4"). Burning is not recommended when winds exceed 15 km/hr or are gusting. A means of extinguishing the fire must be on site during operation of incinerator. The person using the incinerator is responsible for its safe operation. 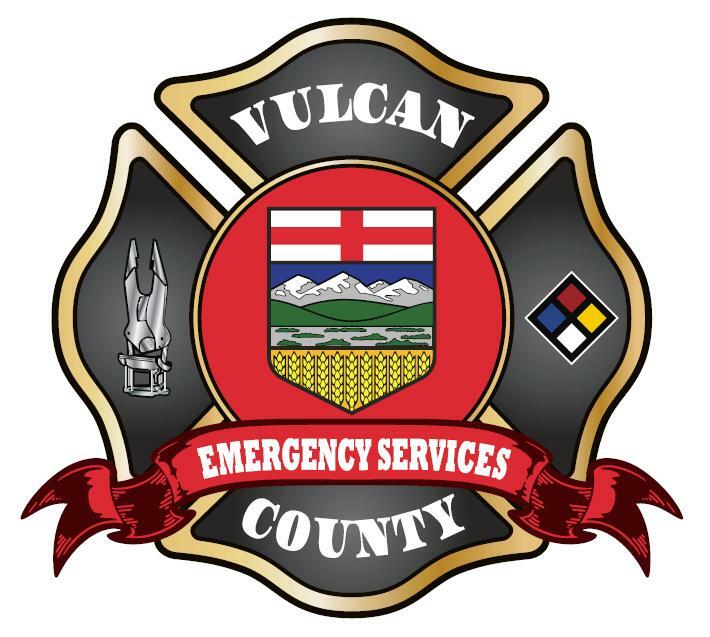 If in doubt, contact the Vulcan County Fire Chief/Deputy Fire Chief. Special regulations must be followed by those who have a fire permit to burn brush or debris after land clearing or other agricultural activities. These activities will be covered under a Class II Burn Permit. If you are burning Agricultural lands (range/pasture, swaths or stubble), the Agricultural Manager must be contacted 48 hours in advance of the burn. No fire shall be ignited for broadcast burning of grass or stubble without first obtaining a fire permit from the Fire Department at (403) 485-3115. Windrows of debris must be no more than 60 meters in length. The area being burned must be completely surrounded by a guard cleared of combustible material to a width of not less than 15 meters. No windrow shall be closer than 25 meters to uncleared land or standing combustible fuels. Parallel windrows must be separated by not less than 15 meters. Every fire must be supervised and controlled by a responsible person or persons. - cultivation equipment as directed by Fire Chief. - two (2) round mouth shovels and one axe. Ensure that your fire guards are wide enough and cleared to prevent sparks from your fire. Large fires can carry sparks over a considerable distance. Have required tools ready at the fire site and enough portable water to control fire if required. Even for a small single pile you should have a shovel and water available. If you have any brush piles, burn only as much as you can keep under control. Check to see if any neighbors will be available to assist you if you require emergency assistance. Do not start to burn under windy or gusty conditions. Whenever possible, plan your burn for early in the day. You will get good burning time if you start at 7:00 am and burn through until 10:00 pm. When your burn is completed, speed up any final extinguishing by dispersing any smoldering ash or accumulation of burned debris. Fires can remain dormant in large piles for long periods and usually surface when fire hazard conditions are extreme. Persistent hot spots left to burn out must be well guarded. When the weather gets dry, any holdover fire must be extinguished. Continue to check completed burning projects to be sure no holdover fires are present. One of the most serious burning problems is caused by hold over fires when it is assumed they are out.